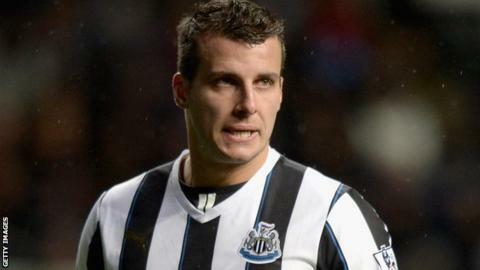 Defender Steven Taylor wants Newcastle United supporters to "stick together" with the players and finish the Premier League season on a positive note. The Magpies ended a six-match losing run with victory against Cardiff City on Saturday - one of just three victories at St James' Park in 2014. However, sections of the support staged a walkout during Saturday's 3-0 success in protest at the club's management. "It's been frustrating for the fans," Taylor told BBC Newcastle. "The main thing is we have to stick together and come through it. We've been through the hard times. "We got the victory and let's go to Liverpool now and try to end on a high," Taylor said. Taylor was one of the goalscorers for Newcastle against Cardiff as they hit three goals at home for the first time since the 5-1 thrashing of Stoke on Boxing Day. Part of the frustration for fans has been the slump in results - the Magpies started 2014 in eighth place with 33 points from 19 games, but subsequently picked up only 12 points from a possible 42. "It's difficult when we're not getting results but the performances have been there," Taylor added. "We haven't been able to score and it has been frustrating, but you saw we're still together (against Cardiff) and got the win."